The Hospital of the Holy and Undivided Trinity in Castle Rising was founded by Henry Howard, Earl of Northampton, as a memorial to his grandfather Thomas Howard, 3rd Duke of Norfolk. 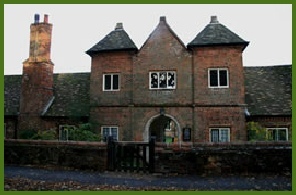 The almshouses were built between 1609 and 1614 at a cost £451 14s. 2½d and were of Norfolk red brick construction with, originally, thatched roofing. Henry Howard’s will established a charity which provided sheltered accommodation for 12 women from Castle Rising Parish. The rooms for the ‘Sisters’ were arranged around a central courtyard. Each room contained a bedstead, chair and small stool-table. To be eligible for admission, the Sister was expected to be ‘of an honest life and conversation, religious, grave and discrete, able to read … a single woman, 56 years of age at least, no common beggar, harlot, scold, drunkard, haunter of taverns’. 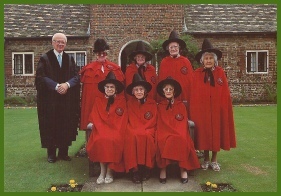 The Sisters had to attend chapel every day, attend St Lawrence Church every Sunday and Holy Day dressed in their distinctive black hats and blue (later red) livery gowns, and say prayers for the founder whose badge they wore. In the early seventeenth century each Sister was given eight shillings (40p) per month, eight pence (3p) on festival days, an annual ‘chauldron of coal’ and a gown ‘of kersey’ (brown woollen cloth) for everyday wear. They were expected to ‘live lovingly together, as Sisters ought to do, and … help and cherish one another in sickness and in health’. A resident ‘Governess’, appointed by a committee of ‘Assistants’ who administered the charity, was in overall charge. Despite several renovations over the centuries, the original building still stands today, and still provides a home for a number of ladies. Famous visitors to Trinity Hospital include Alexandra, last Tsarina of Russia, and her daughters in 1912, and numerous members of the British Royal Family during their stays at nearby Sandringham House.